This line never worked on our parents, but it doesn't stop us from trying to escape blame by making excuses whenever we can. But Eddie Brock really has the king of all excuses: I was being controlled by a hungry alien Symbiote at the time! And he has a point. It's not his fault he was an ideal host. But as Eddie and Venom (that's what the Symbiote calls itself) get to know each other, their relationship becomes less one-sided. Eddie suggests that not everyone deserves to be eaten, while Venom teaches Eddie the finer points of devouring live lobsters and throttling assailants with gooey tentacles. In short, they become more of a team. Good thing, too, because Eddie and Venom are being chased by a villain with a penchant for grand rationalisation himself: medical and tech visionary Carlton Drake. Eddie and Venom team up to try to save the world. Another admirable character is Dan, a rival for the affections of Eddie's ex-fiancée, Anne. When Anne spies Eddie lurking outside her flat, she introduces him to Dan, who greets Eddie with genuine warmth. And when a Venom-possessed Eddie makes a scene in a swanky restaurant, Dan discourages folks from calling the cops and takes Eddie to the hospital instead. Another standout: A whistle-blowing scientist, Dr. Dora Skirth, risks her career, family and life to bring Drake's excesses to public attention. Just before infecting a guy named Isaac with a Symbiote, Drake goes into a longish spiel about the biblical character Isaac, and how it was he, not Abraham, who was making the real sacrifice. He then tells Isaac that given all the world's problems, it's clear that God has deserted humanity…but that he never will. Eddie and Anne are engaged early in the movie. We see them talk companionably in the morning, then kiss and fall into bed in the evening. Venom, separated from Eddie, inhabits Anne for a bit—transforming into a shapely, obviously feminine version of Venom. Anne/Venom and Eddie kiss passionately, which doubles as a mode of transference for the Symbiote. They talk about the kiss later, and their conversation contains a double entendre or two. Symbiotes are violent critters, and we earthlings get pretty violent right back. Venom (and Eddie, of course) is attacked by Drake's henchmen and regular police officers, with many of those melees involving lots of weaponry. Venom is shot by the police, apparently without effect, and shrugs off grenades, too. In return, he tosses the armoured officers like ragdolls, and nearly bites the head off of one before Eddie makes him stop. A motorcycle-riding Eddie/Venom races through the streets of San Francisco pursued by Drake's lackeys and by a squadron of weaponised drones. Cars crash and explode, property is destroyed, and the chase culminates in Eddie breaking his legs. The only thing that hurts Symbiotes such as Venom is a certain frequency of sound (which is clearly painful and sends Symbiotes fleeing from their host bodies) and fire. We see at least one alien burned to a crisp in fire, along with his human host. Symbiotes snake into their hosts via osmosis-like roots and tendrils, or sometimes enter or exit their mouths via one long gooey cable. Once possessed, humans can deal with some very serious injuries: One such subject begins walking, even though a bone is grotesquely jutting out of her shin. Hostile Symbiotes are parasitic, and they eat their hosts alive, an organ at a time. We see people drinking wine and beer. The movie works best as an off-kilter buddy comedy. Eddie and Venom share some on-screen chemistry in addition to bodily biology, and that's when the movie gets a teensy-weensy bit fun. 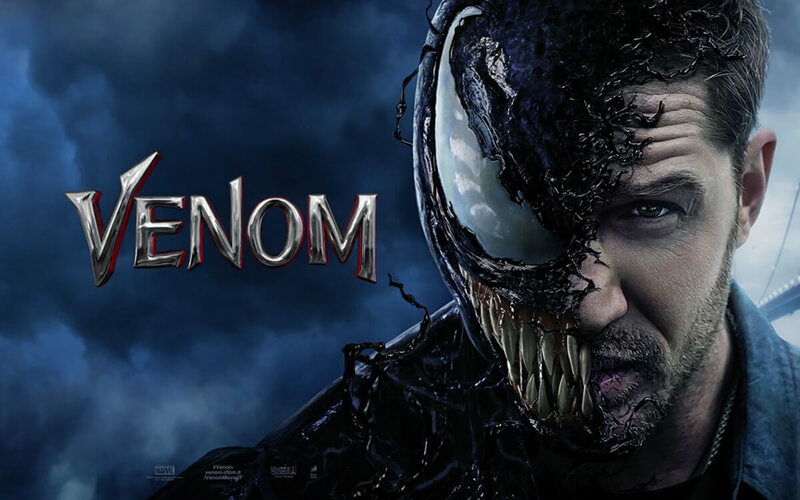 But as a superhero story, Venom lacks teeth: The fight scenes feel like the most boring parts of the movie. Still, Venom isn't as horrible as some have suggested. But it isn't super either. And in this, the Golden Age of superhero movies, we can find better.